We were finally able to do something. My seeds came yesterday, and I was able to plant what I needed to in trays. They live in the kitchen/TV room now. And we thought we were cramped before! HA! Looks like the spring crop is out as I won’t be able to plant them soon enough and it was too wet to anyway, they would have drowned. I’ll keep them for fall…. We bought block yesterday and have begun the floor! 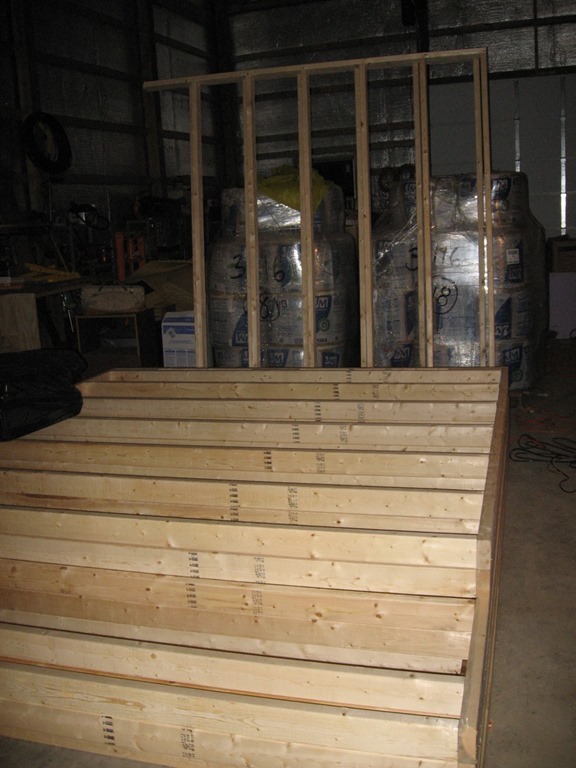 Arlis built a lot of walls during the rain and snow in the workshop/shed while we waited for weather to cooperate. It may not be raining today, but the mist is awful and cold! Our house is sooooo much warmer than the one in Knoxville. 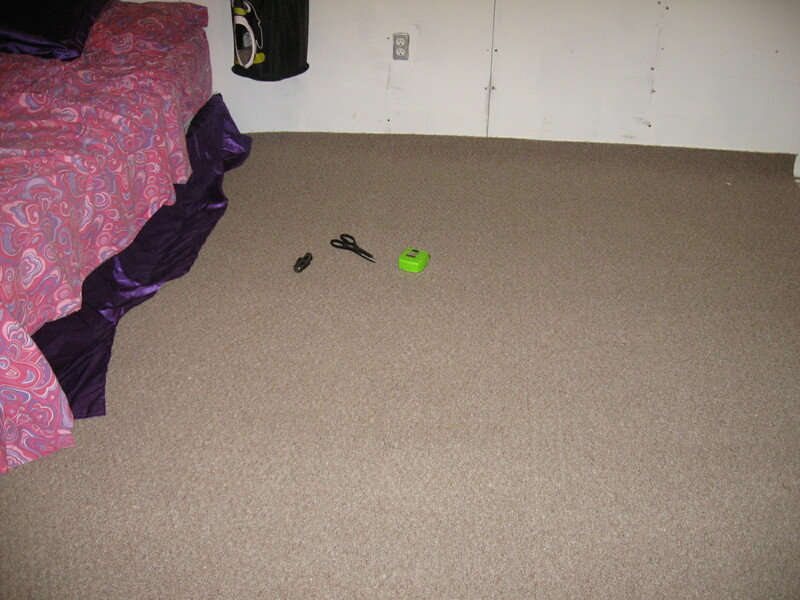 I don’t know if it’s the wood stove, the carpet (we had hard wood in Knoxville) or what. That’s his little beak sticking out and we can watch it move and tweet now. The shell comes off and they can get air from the outside now. 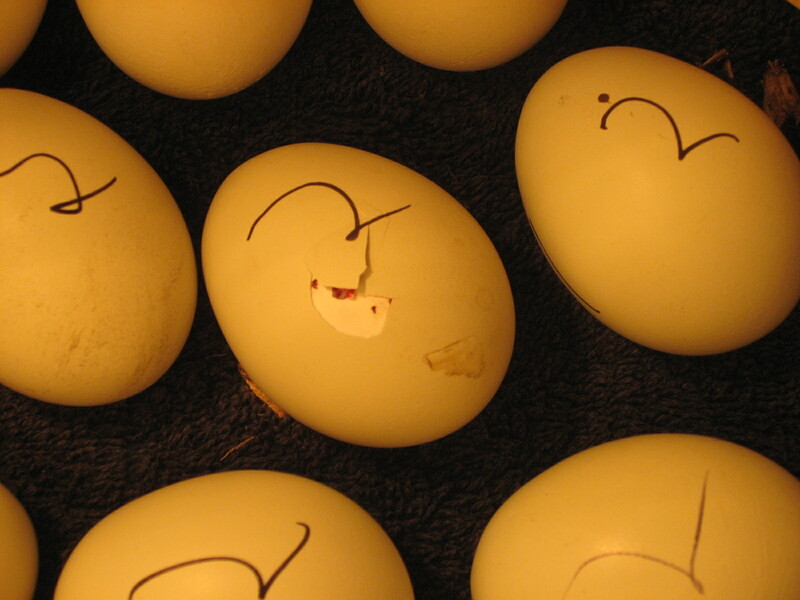 You must stop turning the eggs three days prior to this so the air sac can settle and they can breathe to hatch properly. Now he will rest before “zipping.” What he has done so far is called “pipping”. 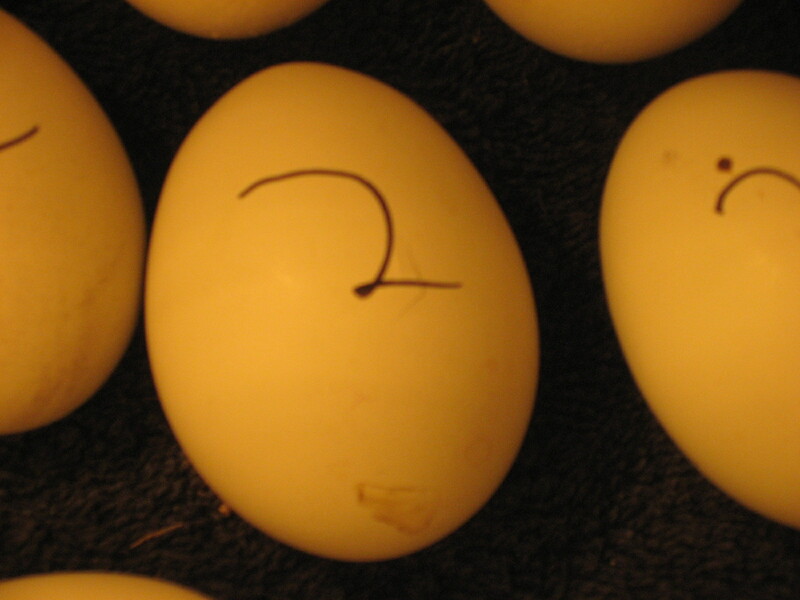 In order to zip, he must turn 360 in the shell and pip all the way around through the egg and both membranes. I decided to look under others for some odd reason, and found this little guy (see below) face down on the towel. I turned him to get some air. At this point, we are getting concerned as progress has stopped for several hours. We discover, that although the humidity here is over 85%, the heat lamp is drying them out. So, we take a bowl of water and a wet paper towel and put a corner in the bowl. This is to help moisturize the membrane. 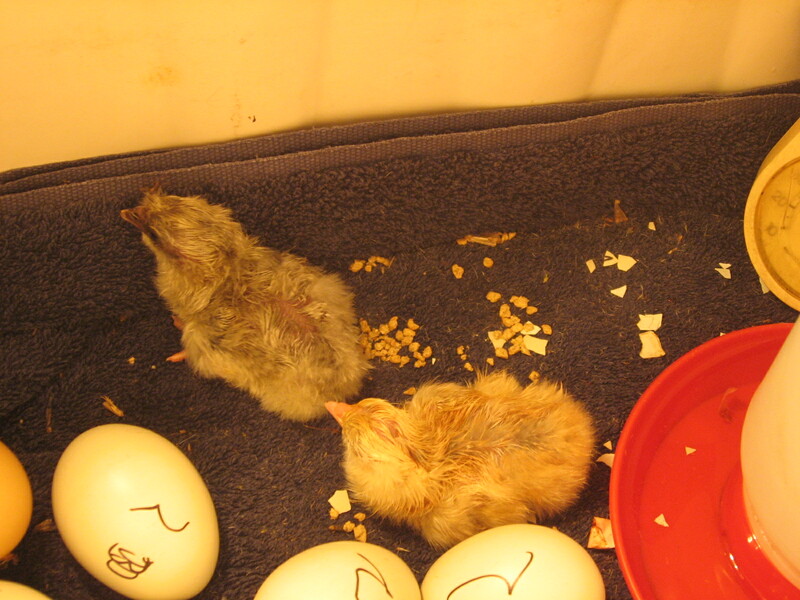 The chicks are stuck to the membrane and unable to rotate enough to zip through the egg. 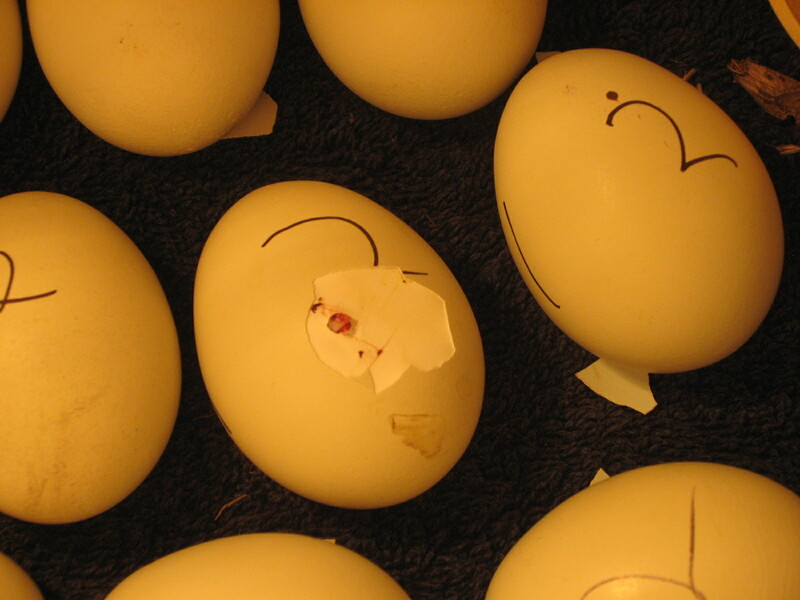 We look online and decide to wait until morning to help them hatch. 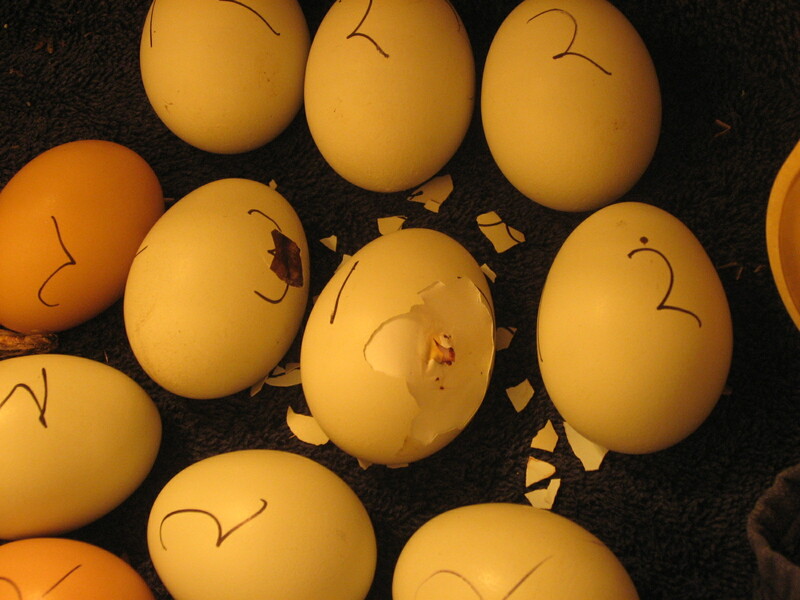 Helping them hatch is dangerous and must be a last resort only. 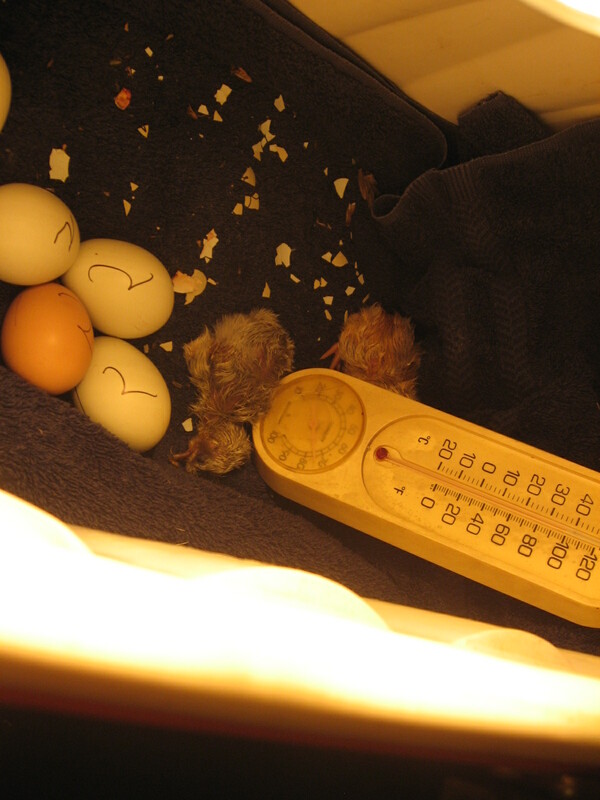 They have enough food from their yolk for three days, so they are fine. It is the next morning and absolutely no progress was made overnight. 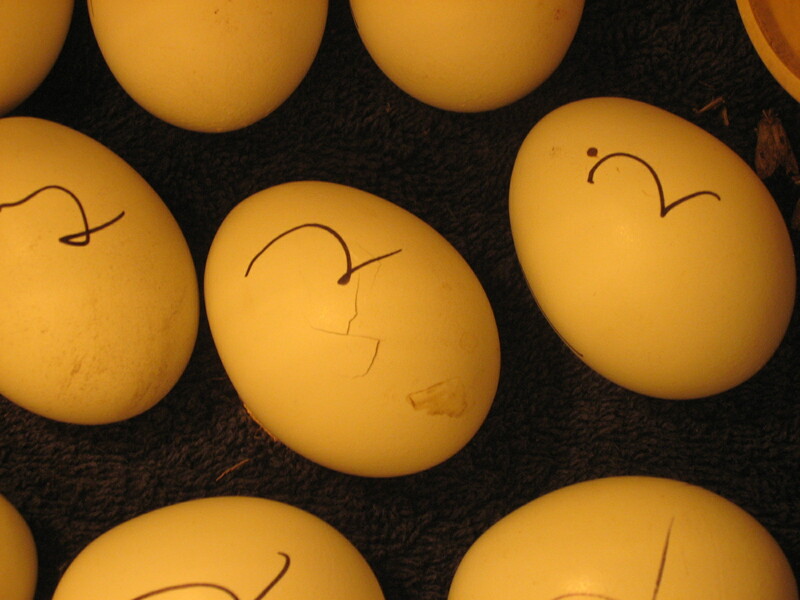 So, a little surgery allowed me to remove the shell in a zipping pattern around the egg. I also CAREFULLY removed a bit of membrane. 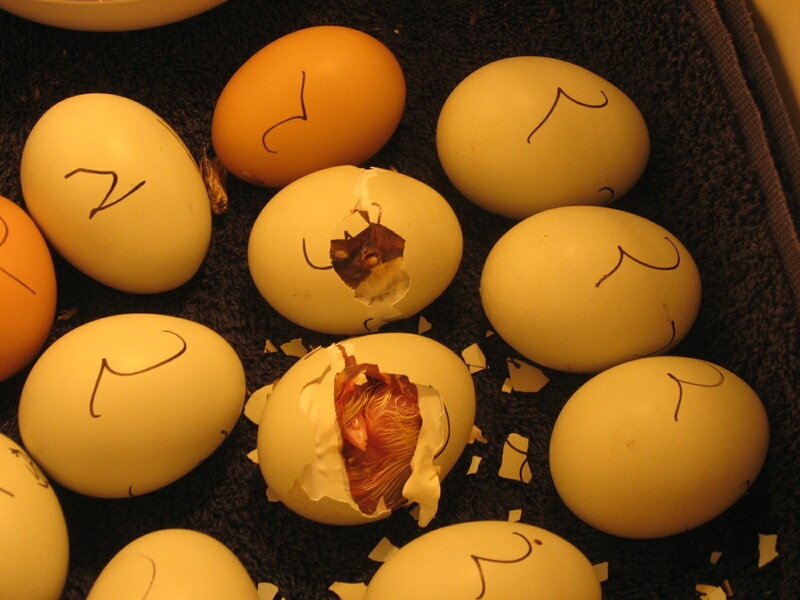 Now, the shell can be removed, but the membrane (the one you peel off a hard boiled egg) can be attached to the inner membrane (like an embryonic sac you don’t see unless the chick grows), and the inner membrane has blood vessels. These vessels need to be broken from the inside only and slowly enough they can stop their own bleeding. This was a very tricky and crucial stage. 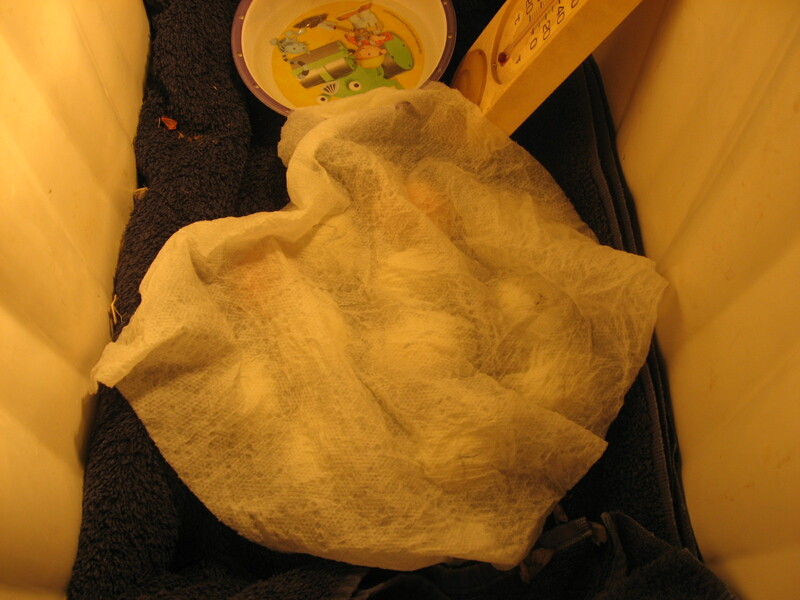 I also had to wet down (Q-tip and water) lots of the membrane and remove it from the chick as it was stuck to it. I don’t think I damaged so much as one feather! He can push his own way out now. 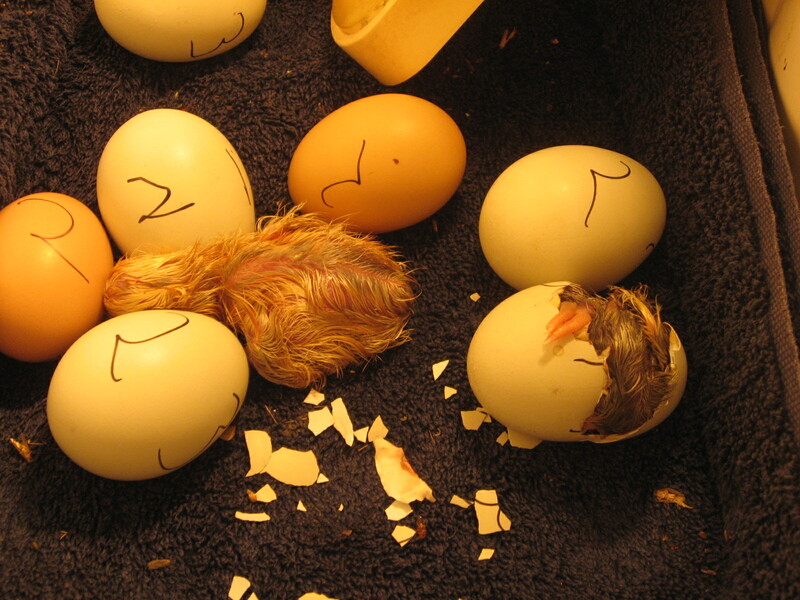 I had to do the same to the other chick, as you can see. They’re both out now. The darker chick had egg attached to him still via membrane. I had to wet it down and help it off, but I’m quite proud of myself and very surprised I must say! It takes about a day to fluff out. and we bought EIGHTEEN chickens. 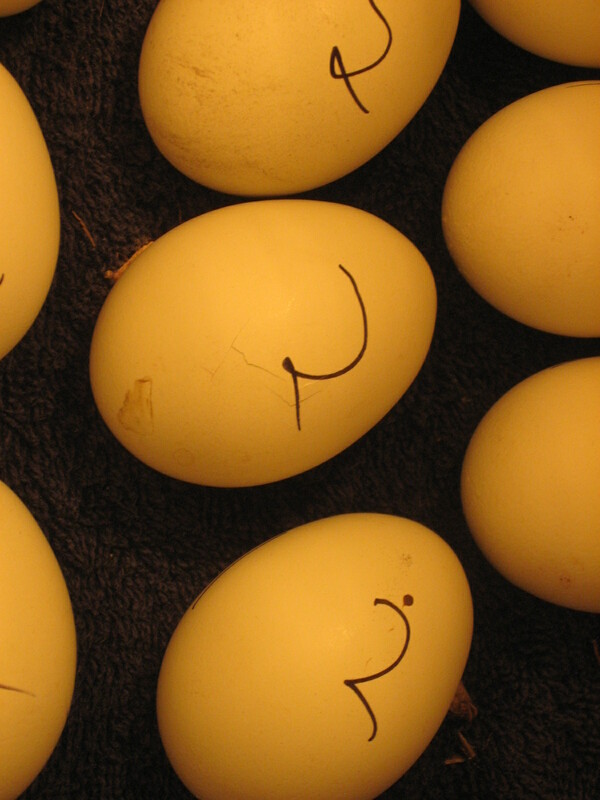 They are blue marans and lay chocolate brown eggs. 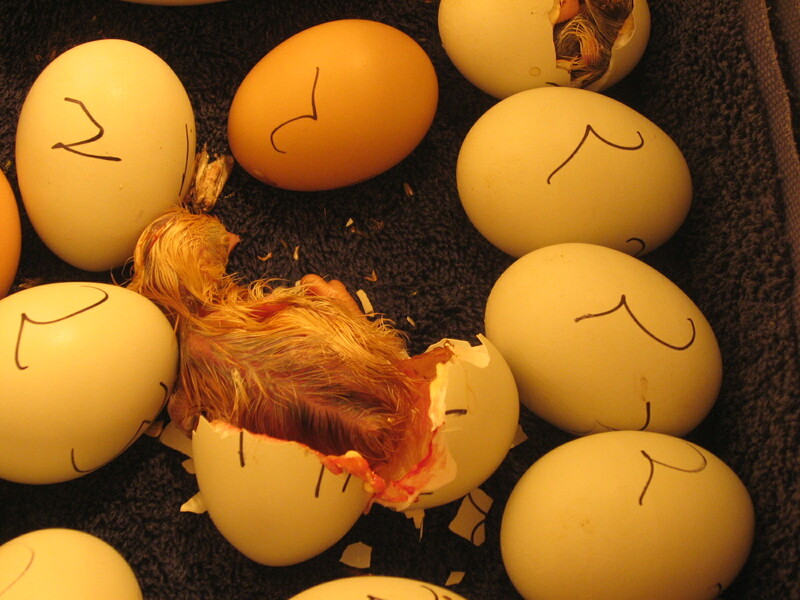 The pigment is actually put on as the egg is laid, so it can be washed off…weird. They are French. We bought 18 for….get this….$30. That’s less than $2 a bird. Now think. Most chickens are about $5 each at the store already butchered. You can buy them for $5 each at flea markets and such, but it’s hard to find that way. They’re usually $10-$15 each, and sometimes $8, I have seen them for $200 each, but that’s obviously a different story altogether. We ate one rooster last night. Well, OK, tried to eat it. It tasted wonderful but was tougher than jerky (dad suggested making dumplings, but one new thing at a time). Arlis made a contraption with a killing cone and an old sink under it with a bucket to catch the blood. We learned a lot, (we need a sharper knife). Marcus liked it (the eating) and Mya had a blast! We are down to just 2 roosters and a cockerel now. The others are too young to tell. 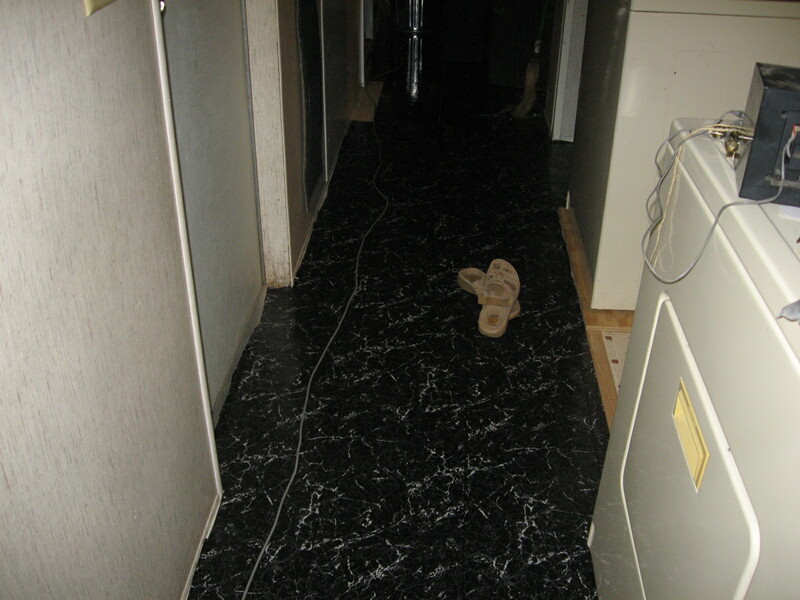 I wanted to flush out his system and fatten him a little-it was pitiful-but he needed to go. They were in a very confined area when we bought them, and I have a video to see how happy they are now. George is a wonderful rooster. He makes sure everyone is in, and he about had a fit when that one rooster didn’t come back-even if he wasn’t nice to him. 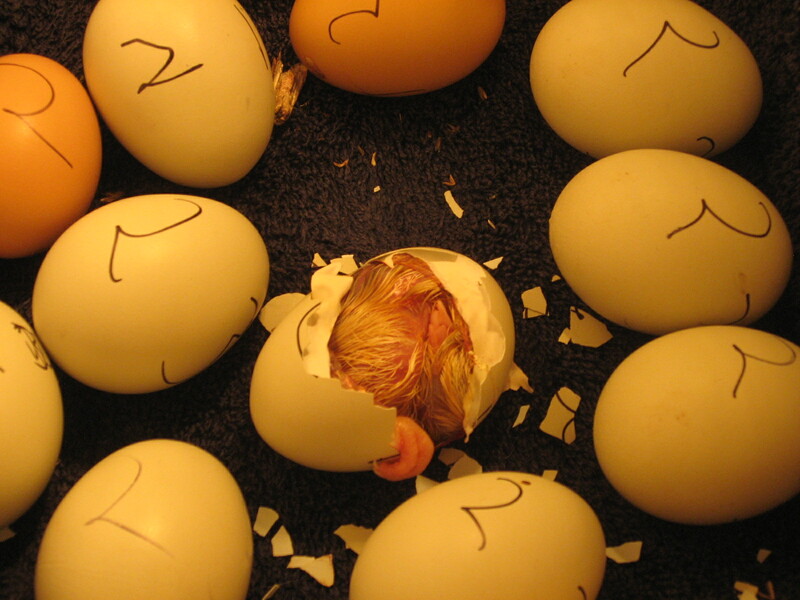 We were able to hatch 2 out of the dozen or so eggs. One is blonde, and the other is black/grey. I call it blonde b/c it’s not the typical yellow. I like the black one. 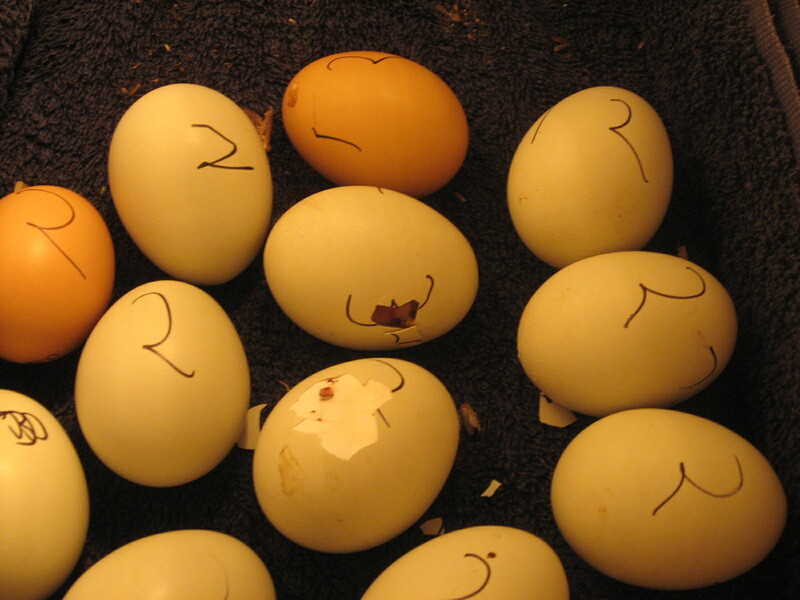 I will have a blog with the progression of the hatching with details and pics shortly. Here they are a couple of days ago. 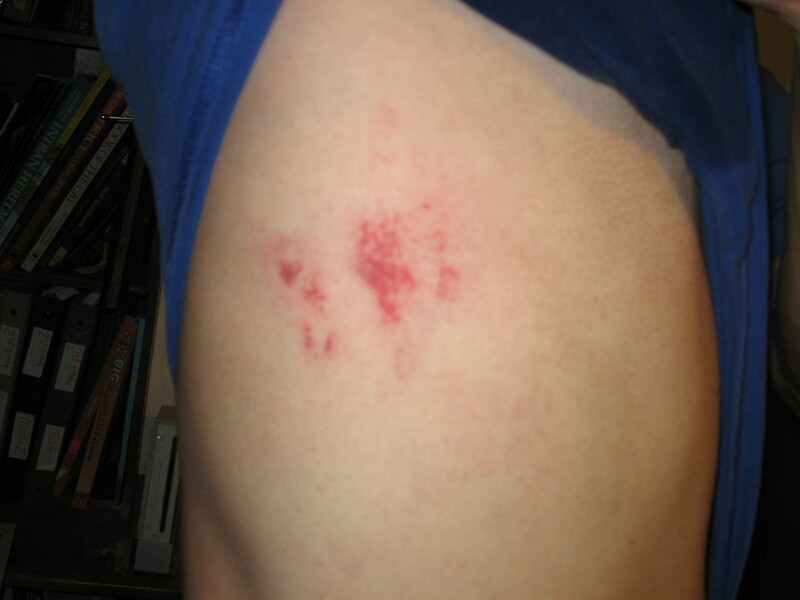 It looks much worse now and I have to be mean to make him stay in bed. He’s not good at taking care of himself, just complaining. 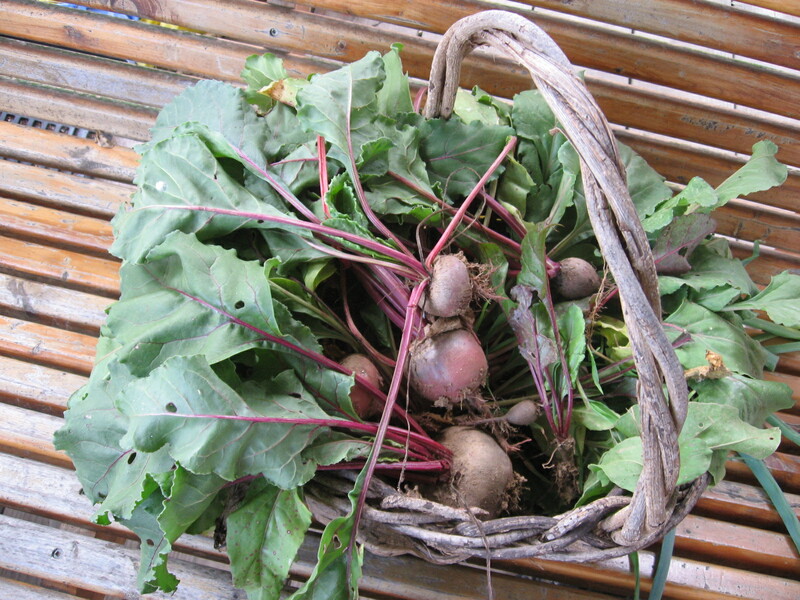 The beets are doing better than in the spring, I think I may grow them in the fall only next year. The peas aren’t doing so well, I think they need to be spring only next year. The japanese beetles have done so much damage that I sprayed the runner beans with Sevin just to save enough for seeds for next year. At this rate, I will be lucky to have that. Merlin keeps coming over. He’s a she and wants me to mate with her. It’s disturbing, especially when your husband thinks it’s funny to grab you and quack. Here is a video of Merlin landing. He does so every morning now and leaves every night too. 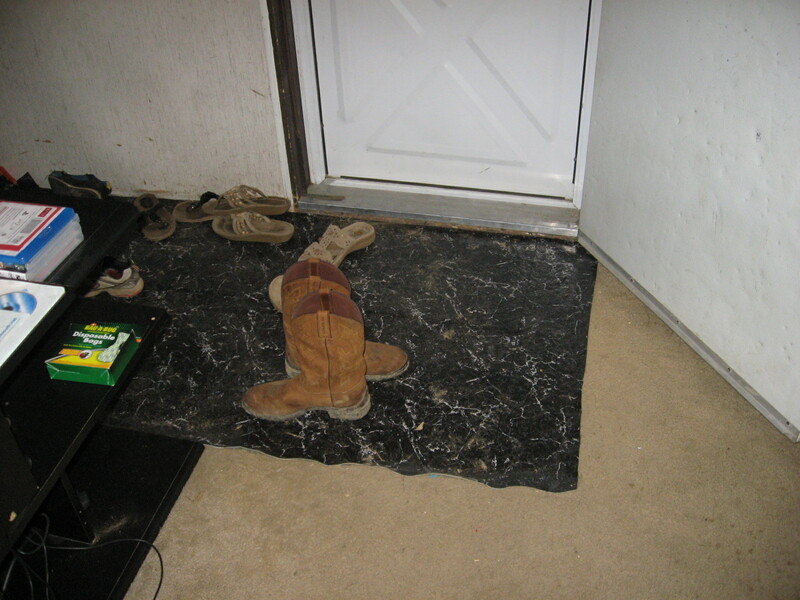 When we first looked at this property, there was wood all around. 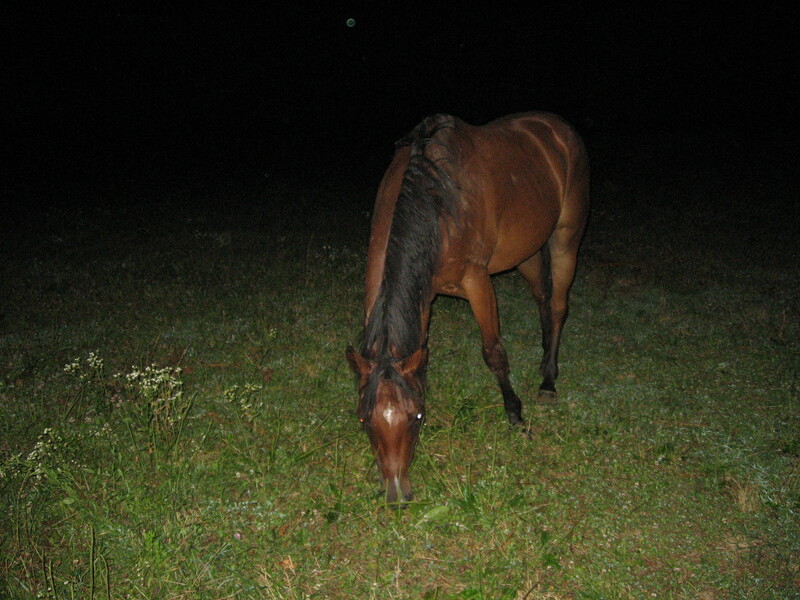 There is now one property that is 1000 acres that has been clear cut. I was quite upset. However, today, we saw cows there. Although the loss of wood has provided us with more forest life than before, including deer and raccoons and snakes, and I hate that they did it, I do not know why they did it. They may have had to for financial reasons or such. 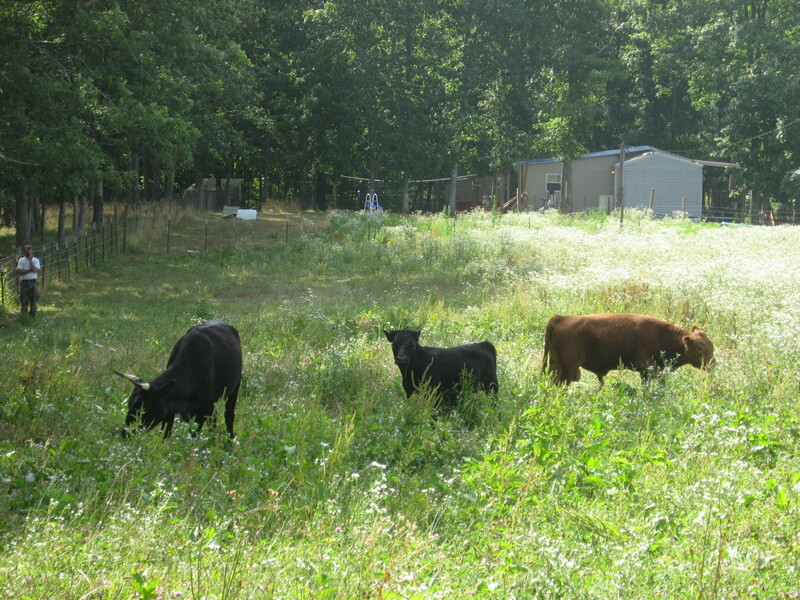 That being said, we are thrilled with the lack of development, and just cattle instead. 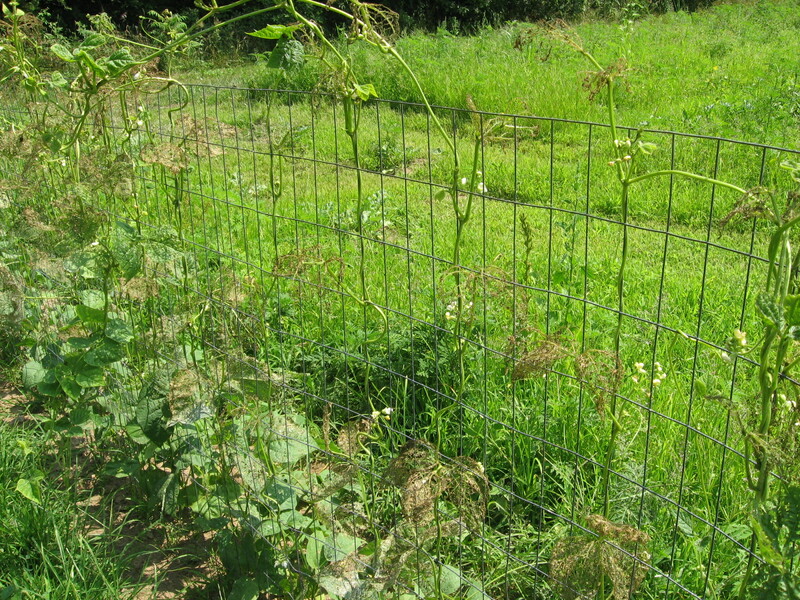 As far as we go, we have many melons on the way along with tomatoes. 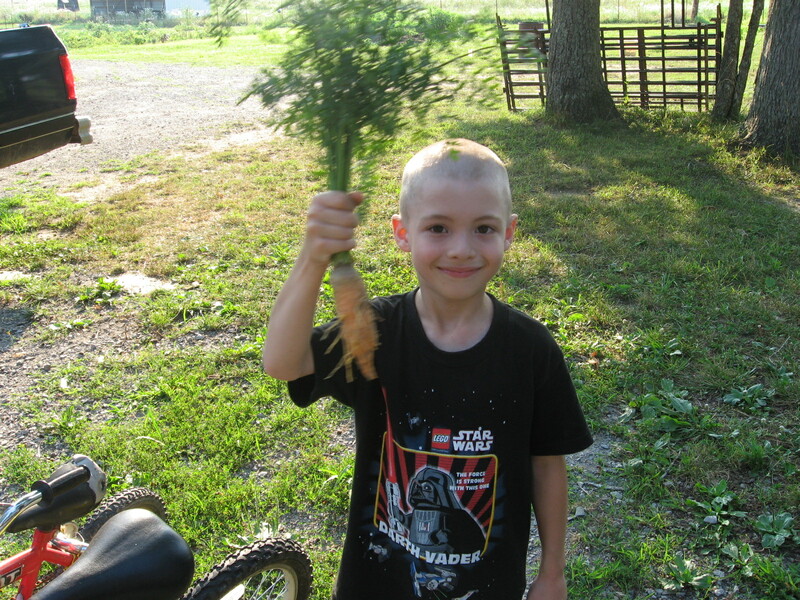 We have our first fall sprout-a pea-and have pulled up over 5 pounds of carrots. We still have more carrots to pull. I’m trying to pull them now before they get too big. They don’t store well for me though. I thought I may have a carrot allergy, only to learn it may very well be they are too old/big. The beans provide us with a dish at least every other day, and quite frankly, could be every day. I’m freezing this year as I am still learning, and will can next year. The bull is named Fargo and here is a picture of them all together. They get on nicely and are very happy with each other. He’s louder more often, but they have hit it off since day one. He takes really good care of them, and they are all happy. He’s smaller than the cow, but only a year old. I’m not growing any of the types of carrots next year that I grew this year. This plant was labeled $2.38, but was really $12.38, only I didn’t see the price at the register or I would have told them to take it back to the shelf and correct their labeling. It is pretty though, and a perennial. Square hay bails get pooped out the back. btw-we’re up to about 2 gallons a day with the Japanese beetles now. that’s not including the water. It did finally rain which saved a lot. 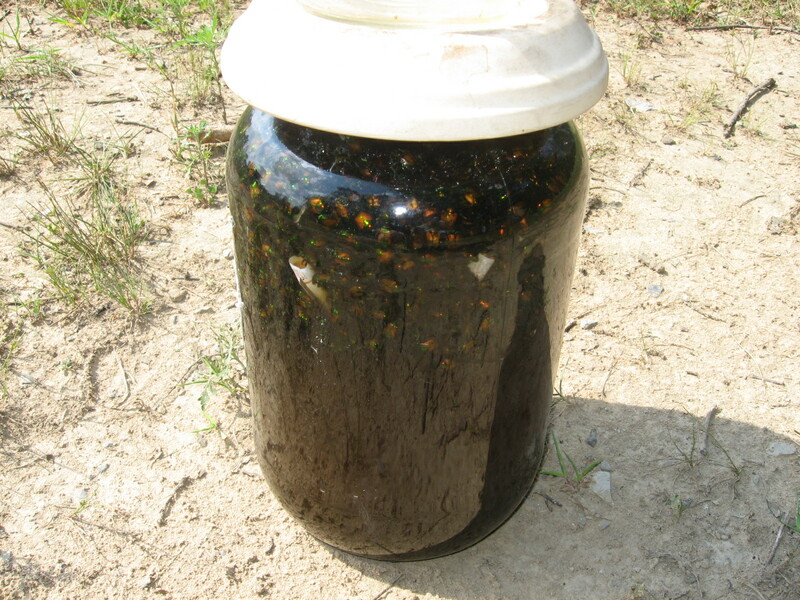 The bugs are so bad, we have 5 Japanese beetle traps that we empty every day. The smell is horrendous. 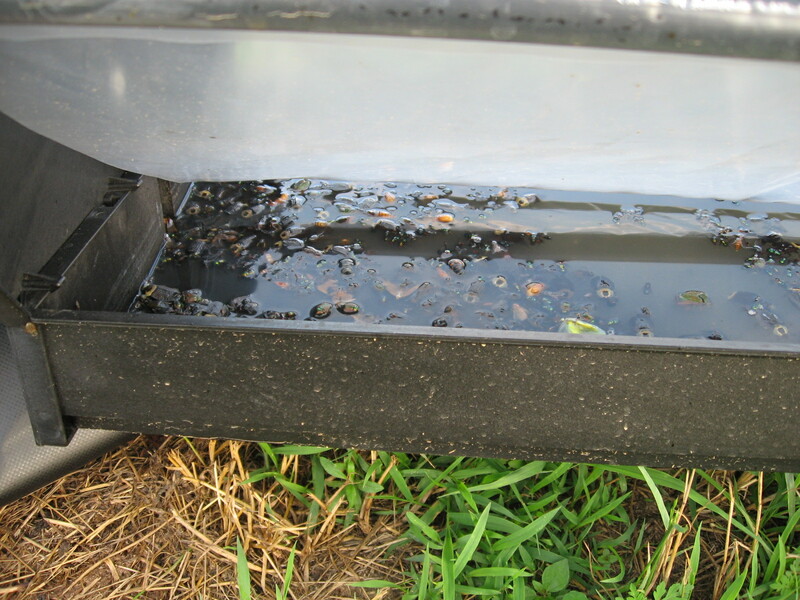 The smell from the dead flies in the $300 fly trap for the cows is bad too, but it’s working. 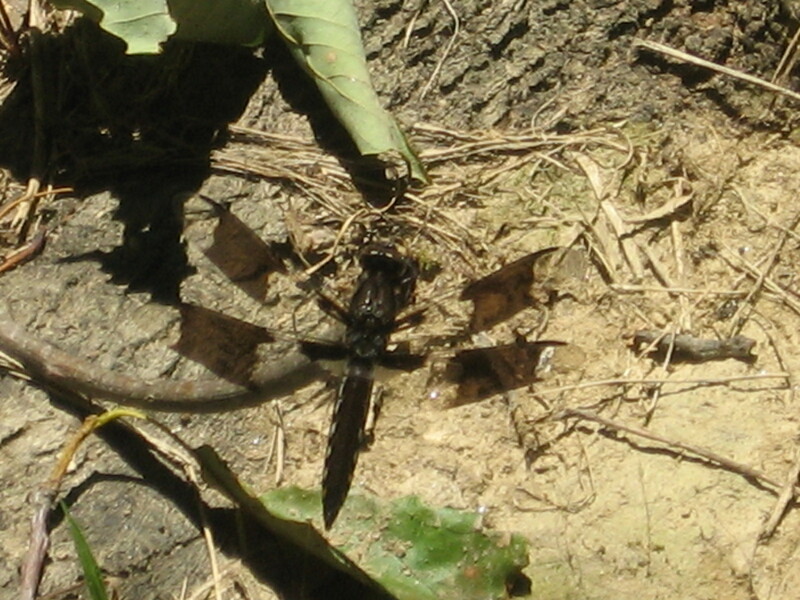 It’s caught bugs I’ve never seen b4, and never want to again. The flies it catches are HUGE. I need to get a picture for you…eww. Here’s one day’s worth of beetles. We usually get more though as this was taken when we only had 2-3 traps going. The bottom part is water, now it’s completely filled with bugs. We throw it in the burn barrel the next day before we empty the traps again, and try to burn them as often as possible to reduce the smell. 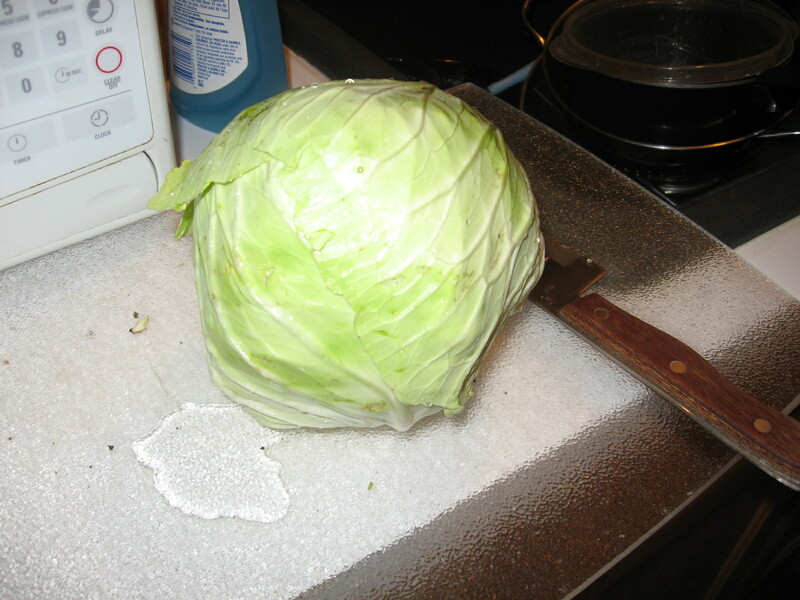 I harvested what the worms left us with the cabbage. It was pitiful, but it was something. I harvested the rest of the beets and did well. 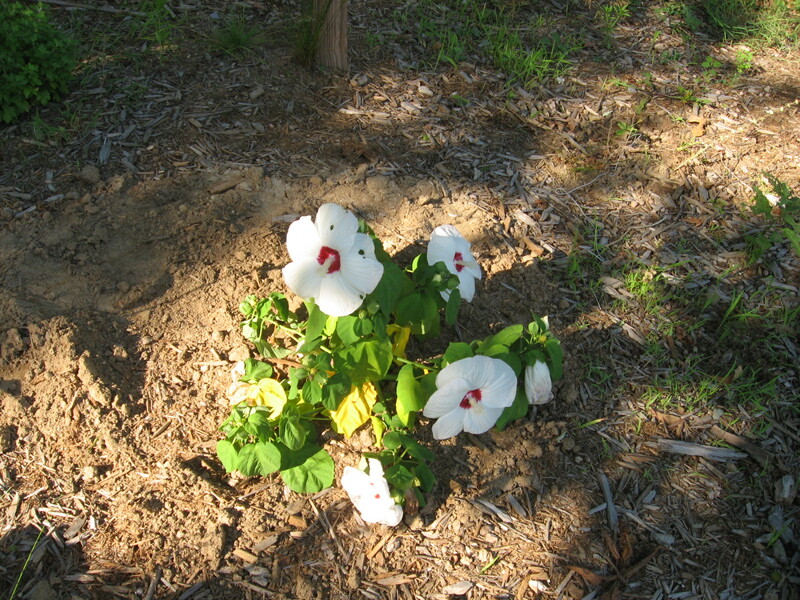 I’m saving about 3 plants of the bush beans for seed. Now, the pole beans are what got eaten by the beetles. 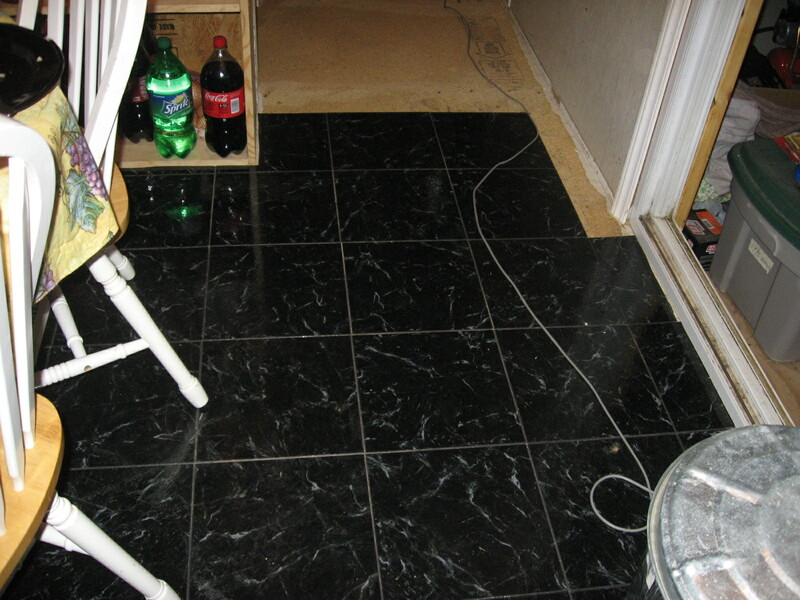 Here is a picture of the damage so far. 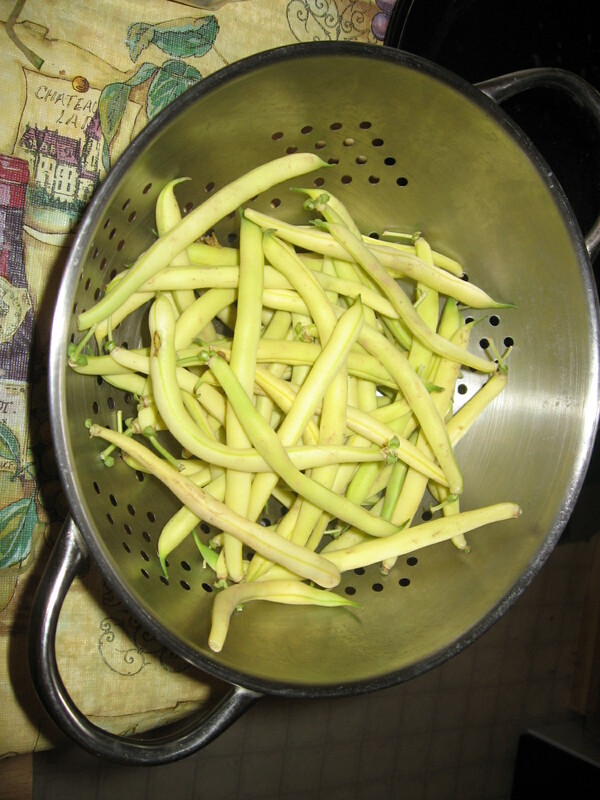 In fact, I think these are the flat type of green bean, so I may not grow them next year anyway. However, the bush (golden/yellow wax) are doing well. Thanks be to dad’s friend Dawn for helping me know when to harvest, and Ana’s friend Shannon for introducing me to the bean in the first place. The cows are progressing nicely. Betsy came to me yesterday and I didn’t have any grain for her! Arlis got her to go into the barn twice with feed. We bought a bull. Registered red polled. Bulls are hard to find to begin with, and we didn’t really want to go the registered route, but it appears as though we may have enough room for more than enough beef/dairy, so we may sell some in the future and registered (as we have so far been told) sell better. Dexters are red and dun too, and polled means he doesn’t have horns. In fact, that is the dominant gene, and both his parents were polled, so it’s possible he’s double polled which means all calved from him will be polled (without horns). We have decided to keep one cow as a dairy, and just have the rest around for production. I just got off the phone with the slaughter house (we were going to do it ourselves, but cows are big, even Dexters weighing in at several hundred pounds, and there are just the two of us, a rope and two trees, so we are considering other options. That being said, it is $24 kill fee and $.25 (what ever happened to the “cent” sign?) per hoof pound. 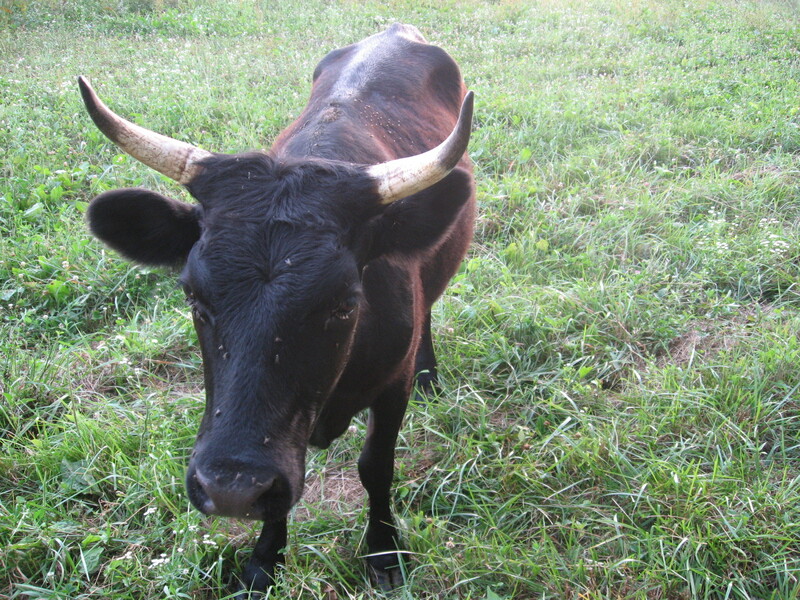 Now, you got about half your weight, and they will save the horns and skin for me so…that comes to… $.50 per pound plus kill fee plus pickup/delivery (we need to get a cattle trailer) for NO HORMONE, PASTURE FED “ORGANIC” BEEF!!! I am NOT complaining…but I still need to talk to Arlis about it. 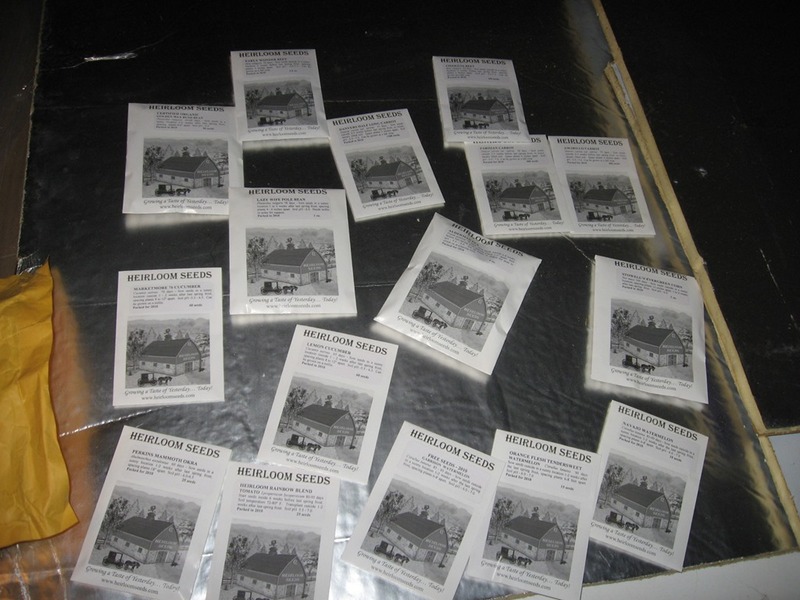 Twenty-five pounds per row, we bought 50 pounds, so that’s…over 75 pounds net gain. And, we think we can get another crop, I have some sprouting in the sun and will manure the furrow we just made with the plow and plant that row over again to see what happens. If we’re able to, then next year we can have two crops of potatoes and maybe sell some!! 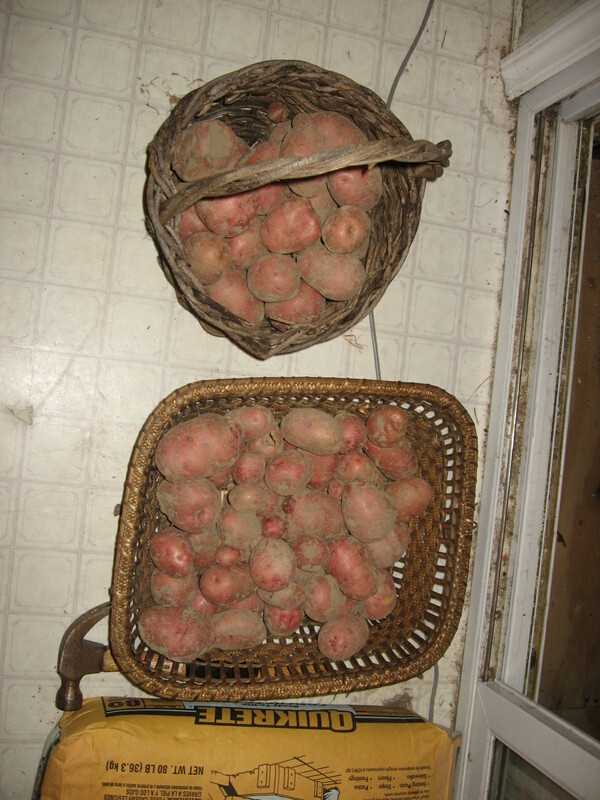 Anyone interested in poison free red potatoes??? I will admit, we used seven dust on the pole beans, but it was absolutely necessary. Arlis dusted them until you can barely see the leaves, and I’m not sure how I feel about eating the beans off of them that have dust on them, because there are some immature beans on there now. All in all, the bull will be here in a few days, we’ve started our fall peas, carrots, and beets, and I just have to keep telling myself to be patient, you can’t do it all in one day so quit trying. 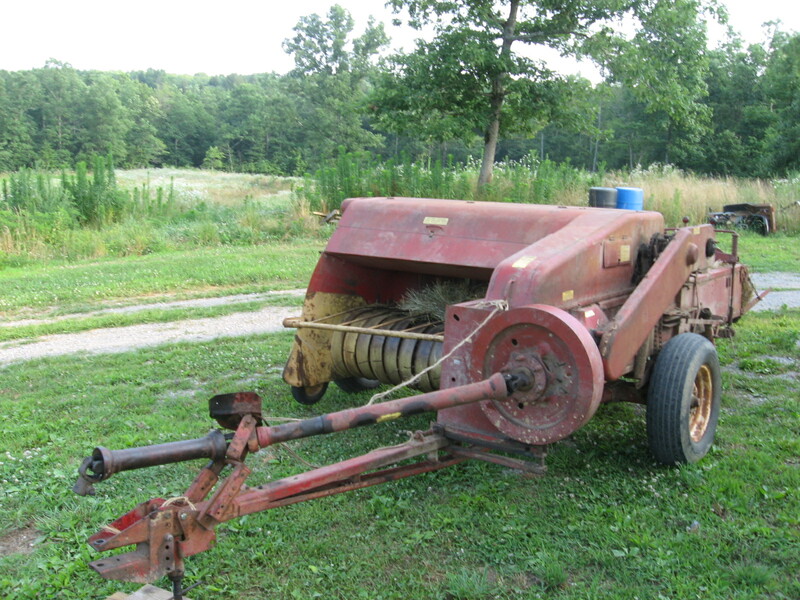 We bought a hay rake and bailer and are looking at a sickle mower. We can cut on halves (that means you cut someone’s hay and rake it and bail if for them, and you get to keep half of what you bail), and since it’s a square bailer, we will be in high demand if we ever want to sell as square bails are getting more and more rare.